The NBA Playoffs are rapidly approaching; the best time of year for professional basketball fans. But let’s just cut to the chase, shall we? The upcoming playoffs are about one thing only… whether LeBron James can finally win a ring. I’m going on record right now as saying I think the Miami Heat will win it all this year. I know that’s not necessarily taking a huge risk considering they made the Finals last year and have been heavy favorites ever since LeBron took his talents there. But despite his MVP-caliber season, the Heatles have been passed by, at least record-wise, by the Oklahoma City Thunder, Chicago Bulls and even the venerable San Antonio Spurs. Of course, none of that matters if the Heat can hold home court and muster up just one road win in Chicago. That shouldn’t be all that difficult for a team that features two of the best players in the universe, should it? Don’t get me wrong. I still think a number of teams out there can win it all. 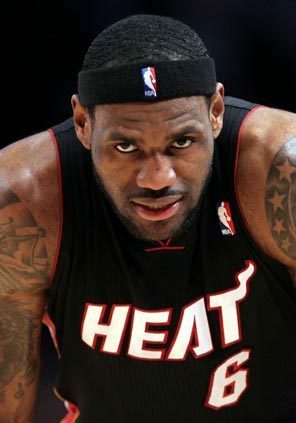 The Spurs, Lakers, Celtics, Mavs, Bulls and Thunder are all perfectly capable of being the last team standing, but the pressure on all those teams combined isn’t a fraction of that which rests firmly on Miami’s, and more specifically LeBron’s, shoulders. After all, those other teams didn’t boldly promise ring after championship ring. I’m not here to bore you with series predictions, match-ups or team-by-team breakdowns. What I will say is that if Miami doesn’t win it all this year, all hell will break loose. The earth will open up and frogs and locusts will fall from the sky. If you thought the Bron-bashing was bad after “The Decision,” wait until you see what happens if he swings and misses AGAIN. Three strikes and you’re out, Mr. James. 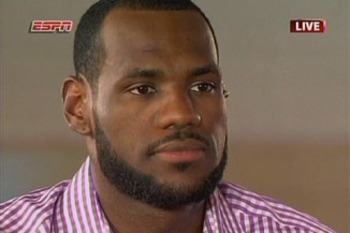 In case of another collapse, if LeBron James has one ounce of sensitivity in his body, which I believe he does, he better find a secluded island somewhere, preferably with no televisions, newspapers or internet, because the criticism will be relentless. I don’t even want to think about what happens if he refuses the final shot in a deciding game. I may have to sell my television. James has now been in the league eight years. He’s won two MVPs, and perhaps this year, a third. He’s been to two NBA Finals and lost them both. Despite his indescribable talent (career 27-7-7 guy, already one of the top 50 scorers of all time! ), we can at least, for the time being, stop comparing him to the game’s greatest, unless of course we only include the title-less. The upcoming playoffs are all about LeBron James, there’s no way around it. This has to be his year. Statistically, he’s having one of his best seasons ever, averaging career highs in field goal percentage and rebounds per game. He is playing determined basketball. You can see it on his face. This is the most talented team he’s ever played on. With Battier, Miller, Haslem, Anthony, Cole, Chalmers, Howard, Turiaf, not to mention Bosh and Wade, the Heat are deep enough to compete with, and beat, anyone. There are no more excuses for King James. In a league that is all about legacy and hardware, LeBron’s shot clock is winding down. Even though he’s only 27, he can ill afford to make another deep run only to come up short. He has to start stockpiling titles now. For a player who entered the league with such high expectations, coming up short will once again will bring unprecedented, yet deserved, criticism. Hoisting the O’Brien Trophy, however, will exorcise those demons in one fell swoop. For his sake, and for the sake of my television, we have to hope that happens. LeBron James is too good of a player to not win a championship. We’ve been saying that for a while now. This will be his year. It has to be his year. If not, he might want to find a good place to hide. This entry was posted in Featured, Hardwood and tagged Chris Bosh, Cleveland Cavaliers, Dwyane Wade, LeBron James, Miami Heat, NBA, NBA Playoffs, Shane Battier by Chris Humpherys. Bookmark the permalink. Actually he does have an excuse for not winning it all. The Heat don’t have a decent center and in the NBA, teams without a 5 will have a tough time competing. Sounds like someone who’s still upset about Perk going down. Which teams in the upcoming playoffs do you think have “decent centers” and which don’t? LAL/Bynum, CHI/Noah, BOS/KG, OKC/Perkins, IND/Hibbert. Where do I stop? MIA/Anthony? haha/Turief? another joke/Curry? yeah right. I don’t care if Lebron averages 50 pt/gm, you still need a 5 to win it all. And that falls on Pat Riley who never considered that there are 5 players on the court at all times. Now don’t get me started on their less than stellar bench and their just so-so point guard. I think you can get away with having a serviceable center these days and still win. Michael always did. I’d like to make an argument for that statement by looking at recent champions but that might be tough to make. Dallas won it last year and although Dirk was the MVP, the addition of Tyson Chandler definitely pushed them over the edge. The Lakers obviously had Kobe as their MVP the two years prior to that but it helped to have Andrew Bynum and Paul Gasol clogging up the middle. We’ll see how it plays out but regardless, Riley isn’t gonna take any heat (no pun intended) for Miami not winning it all this year. That’ll fall on BronBron primarily and Spoelstra secondarily. I don’t know if it was out of carelessness or stupidity, but Lebron has made himself the heal that most people love to see lose. I would think that James is great for the ratings. Come to think about it maybe it was all by design. Imagine that. And Happy Conspiracy Day Friday to you too, sir. Next you’re going to tell me that they rigged the 1985 draft for the New York Knicks to land the rights to Patrick Ewing. OK, you’re officially over the edge now. You can’t compare James with Jordan. You can’t compare any player with Jordan. There’s Michael Jordan and then there’s all the rest of us mortals. Oh, I wasn’t comparing the two. Far from it. I was just saying it’s possible to win an NBA title without a center. The Spurs won three after Robinson left. The Pistons did it with Ben Wallace and although he was a center, he averaged about seven points a game. I don’t necessarily think you need to have a center to win a title. I think you need someone that can DEFEND an opposing center. Keep ’em off the blocks, neutralize ’em, control the boards and everything’ll work out just fine. Chris As much as LBJ still remains a “virgin” in terms having yet to win an NBA title for the Heat ownership it’s now > or never . Bear in mind the two three years prior to them acquiring Bosh and James they’d lost in excess of $145 million . Nothing to be pleased about given their state of affairs at the time at AAA Arena . Half empty seats for games right up until the signing the duo to complement Wade . 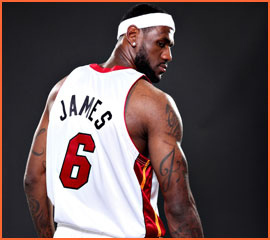 LBJ would like nothing better than to win the “Big One” to solidify his legacy . I bet he’d trade one of his MVP trophies for a ring ! No truth to the rumor that Michael Jordan is trying to lure Brittney Griner to declare her eligibility for the upcoming NBA Draft . I mean after-all Griner can’t any worse a pick than Kwame Brown was back in ’01’ ? LOL, LOL,LOL !!! Can you believe that Brown was actually picked ahead of Tony Parker in that draft ? And TP was more of a proven commodity than Brown ! WTF was Jordan thinking at the time ? Re my piece on Leon Spinks I responded to your comment about a fighter carrying on as long as is possible within the ranks of the MMA genre . By all means check it out and let me know what you think ? Think about it. Who among us won’t pan LeBron if he comes up short again? And for the record, in that 2001 Draft, Kwame Brown was also picked before Tyson Chandler (2), Pau Gasol (3), Jason Richardson (5), Joe Johnson (10), Richard Jefferson (13), Zach Randolph (19) and Gerald Wallace (25) before Tony Parker’s name was even called. If LBJ had simply come into town without the fanfare I don’t think he’d have been given such a hard time ! But it goes with the territory when you simply show immaturity at every stage of your career and expect to be coddled by the press and fans alike . And that has clearly been the case with LBJ ! So knew you wouldn’t need TNT (explosive) iv to implode the Magic’s season . Down goes D-How’ and the lil’ Oompa Loompa …… Stan Van Gundy continues to be a pain in the a$s for anyone who’s willing and not willing to to listen to his constant bitc#ing and whining . Send him to be a bu_t buddy for Zimmerman , that’s if he’s able post “bail” . Your thoughts on the following ? Tebow with his “aw shucks” mentality will look to beat out Sanchez for the starting role on that Jets’ roster . Does anyone truly believe he (Timmy T) wants to be a simple back-up over the course of his career ? It’s Good To Know But Someone Has To Have Your Back …. Or Do They ? You’re right on this one. Here we go again. Another great regular season for LeBron… is the playoffs going to be different? I think so. The Miami Heat are a bit deeper this year. The Big Three is intact and the Chicago Bulls are limping into the playoffs. James might have a really good shot this year. I think that’s a pretty fine line that athletes walk. Just look at how quickly we change our opinions of guys like Calipari or Dwight Howard or Ozzie Guillen or Robert Griffin for that matter. The incessant and rather skewed media coverage only compounds matters. As you suggest, all athletes can do is do their own thing and take comfort that the only opinion that matters of themselves are their very own. Sad ending to a sad season for the Magic, Al. I have a feeling that both Stan Van AND Dwight will out of Orlando by the end of next season. And then what? Back to the drawing board? And are we really going to rely on Otis Smith to rebuild this team? Isn’t he the one that dismantled it in the first place? That’s exactly why I like ’em. And as for all that “They can’t win without a big man” talk, I’m just not buying it. Sad ending for the Magic ? You kidding ? I think it’s friggin’ great ! That team in that guise was going absolutely nowhere ! Van Gundy with his continued bitc#ing and whining is a subpar coach within the NBA ! Howard has still shown that he hasn’t matured as an individual . It makes for combustible mix between player and coach . The Heat having sat LBJ and Bosh still come up short against the Wizards at home . Still think that they’ll (Heat ) stroll through they playoffs this postseason ? On paper without Wade that Heat team still should’ve been able to take down the Wizards . Complacency is what’ll undo the Heat and it’s plain to see that the entire organization still doesn’t understand that , much less the fans jumping on that Heat bandwagon . Well, Al, it’s sad because I’m a fan and it’s a shame what’s happened to this team. Someone in that organization is going to have to make some wise decisions soon for if not, this could be come a 20-win team, without and all-star and playing in a brand, spanking, new arena. The Heat loss to Washington was obviously shocking but I still think they’ll be fine come playoff time.